22 nd August 2018, New Delhi:The Indian economy has grown leaps and bounds in the last decade and has become a power to reckon with. With the FDI being pumped in, every large corporate wants to now manufacture and sell in India. On the other hand, the law & order situation has not improved much in the country. 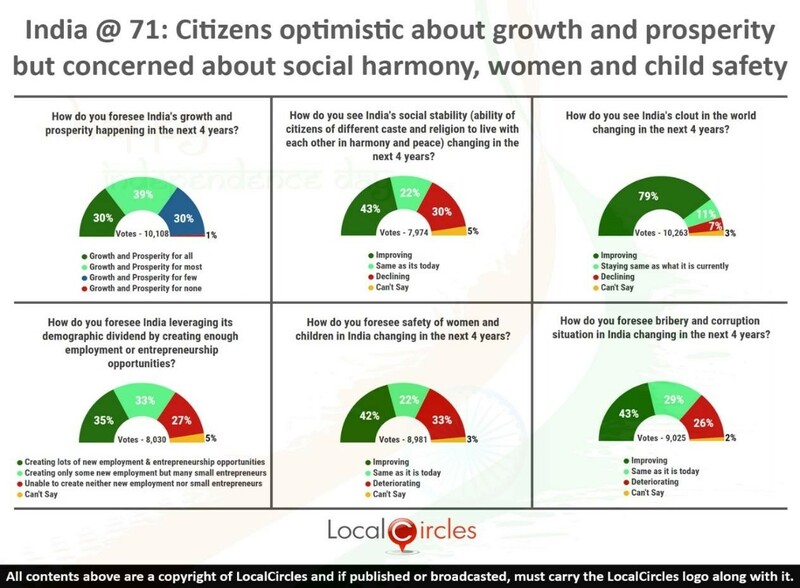 LocalCircles conducted a large study in the week of India’s Independence Day and asked citizens how they foresee India delivering on key citizen parameters like growth and prosperity, social stability, livelihood, etc in the next 4 years by 2022 when India turns 75. In the first question, citizens were asked how they see India’s growth and prosperity happening in the next 4 years. 30% citizens said they foresee growth and prosperity for all in the next 4 years while 39% said they foresee growth and prosperity for most. 30% voted for growth and prosperity for few and 1% said growth and prosperity for none. India is poised to remain the fastest growing large economy in the world and its GDP is expected to reach $5 trillion by 2025. The real challenge for India will be to ensure equitable growth. 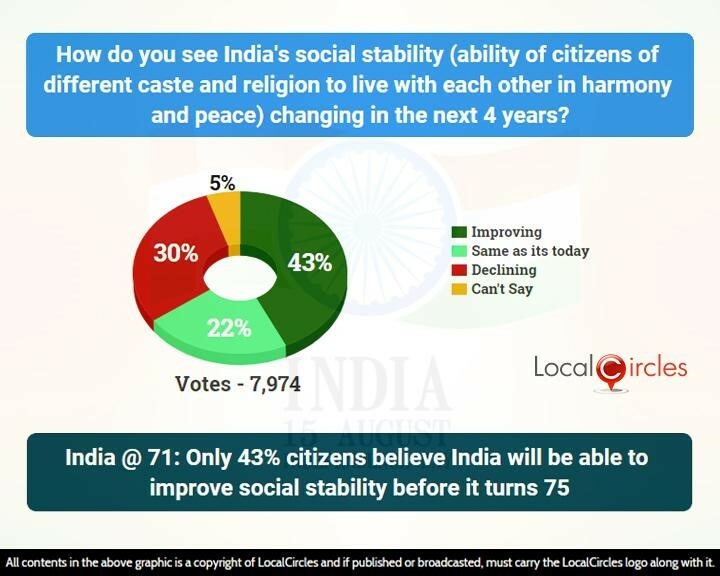 In the next question, citizens were asked how they see India’s social stability (ability of different caste and religion to live with each other in harmony and peace) changing in the next 4 years. 43% said they see it improving and 22% said they see it staying the same as today. 30% see it declining while 5% were unsure. 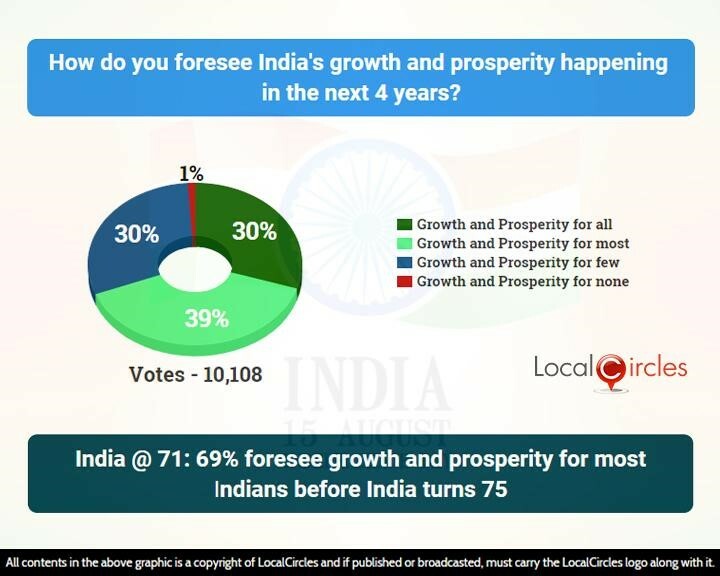 In the third question, citizens were asked how they see India’s clout changing in the next 4 years. 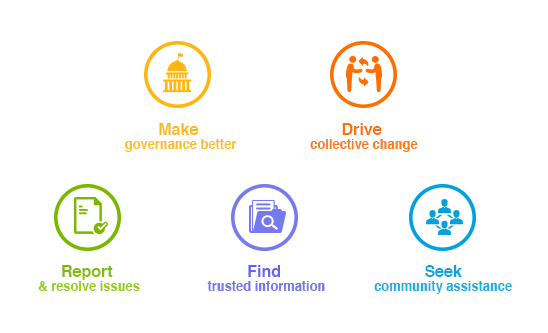 79% citizens said they expect India’s clout in the world to improve before India turns 75. 11% said it will stay the same as it is currently and 7% said it will decline. 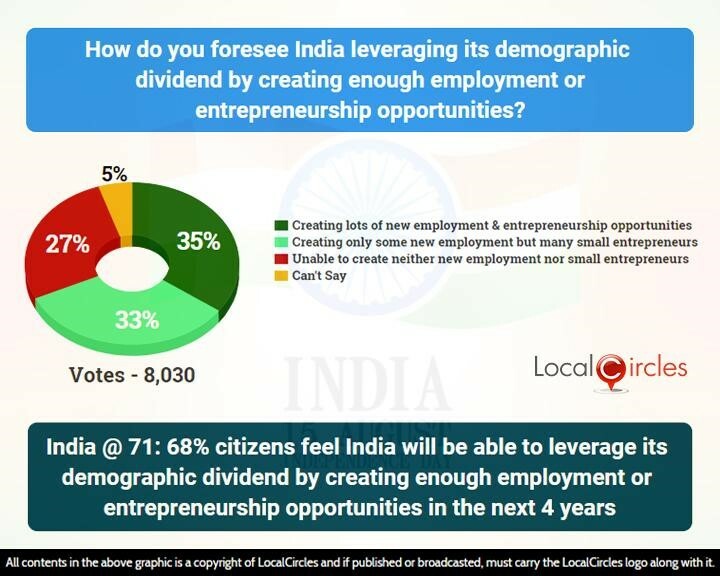 In this fourth poll, citizens were questioned on India’s ability to create jobs and livelihood in 35% citizens said India will be able to leverage its demographic dividend in the next 4 years by creating lots of new employment & entrepreneurship opportunities. 33% said it could be done by creating only some new employment but many small entrepreneurs, while 27% said India will be unable to create either new employment or small entrepreneurs. 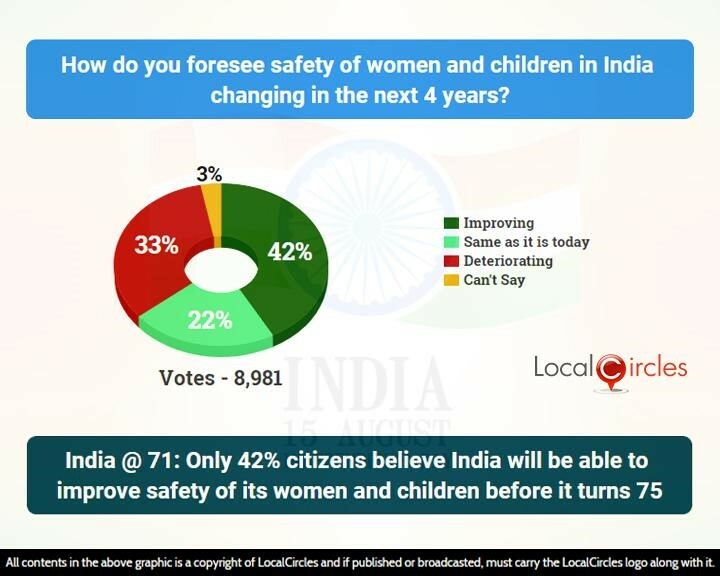 On the question on safety of women and children in India, 42% said the situation will improve in the next 5 years and 22% said it will be the same as today. 33% said the situation will deteriorate further. Cases of abuse and rapes of women and children are reported everyday from across the country. The government will have to make some significant changes to policy and laws, their enforcement and work closely with the judiciary on fast justice to ensure speedy justice in such cases. 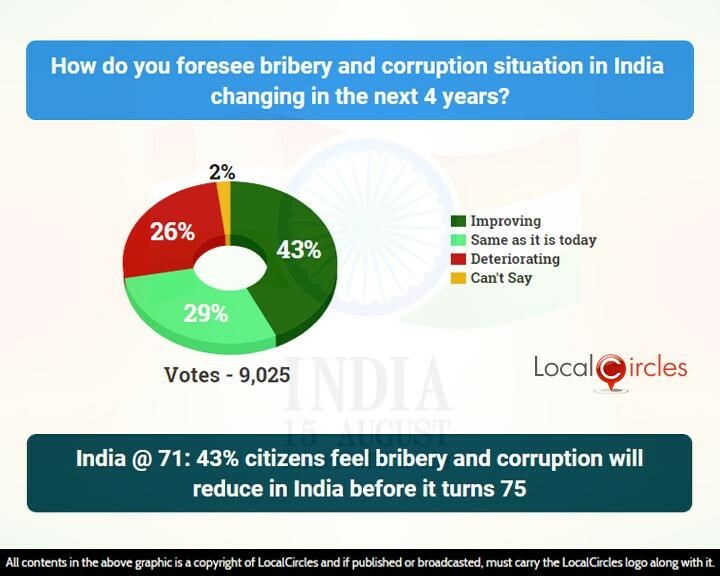 The final question asked how they foresee bribery and corruption situation in India changing in the next 4 years. 43% said they see it improving while 29% said it will be same as it is today. 26% said they see the situation deteriorating. Increase in number of digital transactions, system and unique identification and system-based delivery of citizen benefits and subsidies, a single taxation system are all ways that have helped in reducing corruption and will continue to deliver benefits in the coming 4 years. At the same time, lack of proper anti-corruption agencies at state and local levels, ineffective public grievance systems for corruption issues and slow judicial systems all come in the way of India’s ability to fight corruption. The new anti-corruption law 2018 provides for imprisonment from 3 to 7 years and a financial penalty for those convicted of taking bribes, while the ones found to be guilty of giving bribes can be punished with imprisonment up to 7 years or fine, or both. While this might help as there is a deterrent on both sides now, it also has a new clause where before an investigation agency can investigate a public official, they require approval of an authority which can take up to 4 months in some cases. In some cases, the states do not have a Lokayukta so who will provide this approval is still unclear. When it came to growth and prosperity, the number of people who said they foresee growth and prosperity for few reduced from 35% in 2017 to 30% this year. When it came to growth and prosperity for most, the number increased from 31% last year to 39% this year. 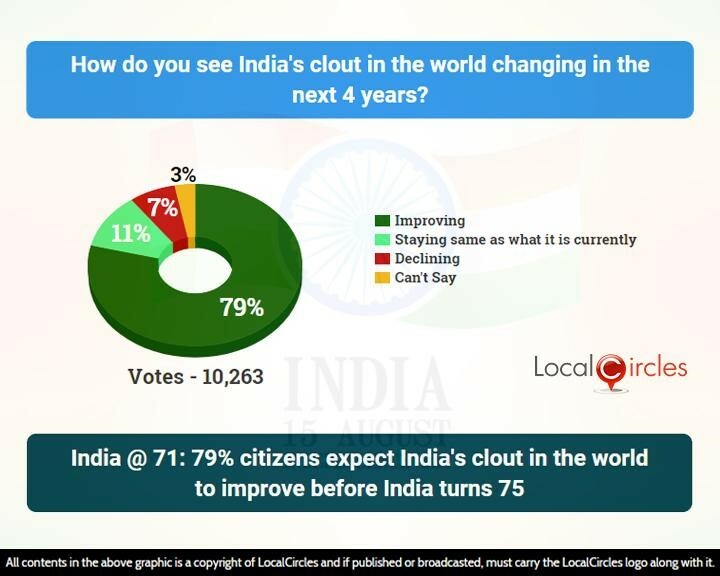 Last year, 75% citizens saw India’s clout in the world increasing, while this year 79% see it increasing. 38% in last years survey saw the social stability in India improving. The number has gone up to 43% this year. The percentage of people who saw the situation declining has gone down from 34% to 30% this year. This year’s number were almost the same as last year’s. the number which said India will create a lot of new jobs and entrepreneurship opportunities increased from 31% to 35%, while there was a reduction of 2% in the percentage of people who said India will not be able to do either of them. Over 54,000 responses were received from over 22,000 unique citizens located in 215 districts of India. Approximately 35% the respondents were women while 65% were men. 42% of the participants were from Metro/Tier 1 cities, 36% from Tier 2 cities and 22% were from Tier 3 and rural locations.